The Shura Council (the upper, consultative house of Egypt's parliament) on Tuesday announced 27 new members of Egypt's National Council for Human Rights (NCHR). Judge Hossam El Gheriany, head of Egypt's Constituent Assembly (tasked with drafting a new constitution) was appointed NCHR president, while Socialist Popular Alliance Party founder Abdul Ghaffar Shukr was appointed council vice-president. · Ahmed Seif El-Islam: Leftist lawyer, human rights activist and founder of the Cairo-based Hisham Mubarak Law Centre. · Ahmed Harara: Egyptian political activist, doctor, and co-founder – along with prominent reform campaigner Mohamed ElBaradei – of the recently established Constitution Party. Harara lost both eyes during last year's clashes between protesters and security forces. · Amira Abul-Fotouh: A writer known for her regular columns in Al-Wafd newspaper. · Ehab El-Kharrat: Member of both the Egyptian Social Democratic Party and the Constituent Assembly's human rights committee. · Hanna Gereis: A Coptic-Christian activist who had been a member of parliament's now-dissolved lower house (the People's Assembly) and a former member of the Supreme Council of the Arms Forces' advisory council. · Safwat Hegazi: A prominent Islamic preacher and supporter of Egypt's Muslim Brotherhood. · Tareq Moawad: A prominent Egyptian activist. · Talaat Marzouk: A member of the Salafist Nour Party. · Abdel-Khaleq Farouq: An economy expert and head of the Nile Centre for Economic and Strategic Studies. · Abdullah El-Ashaal: An international law professor and Islamist thinker. He is best known for having competed in Egypt's post-revolution presidential election. · Abdullah Badran: A member of the Salafist Nour Party. · Abdel-Moneim Abdel-Maqsoud: A Muslim Brotherhood lawyer. · Marianne Malak: A Coptic-Christian and the youngest MP in Egypt's now-dissolved People's Assembly. 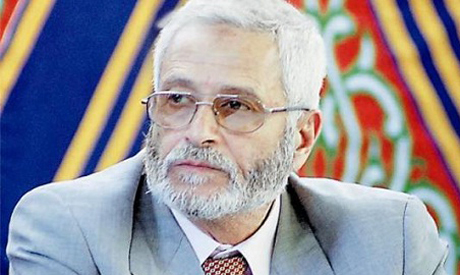 · Mohamed El-Beltagy: Secretary-general of the Muslim Brotherhood's Freedom and Justice Party. · Mohamed Azab: A prominent Egyptian journalist. · Mohammad Zarei: An activist, lawyer, and head of the Arab Penal Reform Organisation. Zarei is also the former head of the Human Rights Association for the Assistance of Prisoners. · Fahmi El-Damati: A prominent lawyer. · Mahmoud Ghozlan: Spokesperson of the Muslim Brotherhood. · Mona Makram Ebeid: A political science professor and former Wafd Party MP. She is currently a member of the Egyptian Social Democratic Party. · Hani Abdel-Aal: A prominent journalist. · Hoda Abdel-Moneim: A lawyer and chairperson of the FJP's women's affairs committee. · Wael Khalil: A prominent leftist activist. · Wagdi El-Arabi: An actor and Muslim Brotherhood member. · Mohamed Toson: An FJP member and head of the Shura Council's legislative and constitutional affairs committee. The new appointments include figures from different political trends. There is a substantial presence – nine in the above list – of Islamist figures, especially when compared to previous eras. Including independents (such as Safwat Hegazi), Brotherhood members and Nour Party members, Islamist figures make up roughly one third of the council. Experts in particular fields, such as prominent human rights lawyer Ahmed Seif El-Islam, and other liberal and leftist activists, account for the bulk of the remaining appointments. Some who are considered liberal – such as Wafd columnist Amira Aboul-Fotouh and leftist activist Wael Khalil – backed Muslim Brotherhood candidate Mohamed Morsi in Egypt's presidential run-off vote against Mubarak-era premier Ahmed Shafiq earlier this year. Ahmed Seif El-Islam is also a member of a new committee, created by the presidency, mandated with looking into civilians detained by the military in the wake of last year's revolution. Wael Khalil, for his part, turned down an offer to join Morsi's presidential team, expressing a preference to remain independent. The National Council for Human Rights is tasked with safeguarding human rights in Egypt. It is responsible for advising state institutions, along with other relevant bodies, on issues related to human rights. The council can also receive complaints and advise and assist parties on appropriate legal procedures to be taken in the event of rights abuses. The council also publishes regular reports on the state of human rights in Egypt. *This article has been amended. The previous version included the name of Bahieddin Hassan, director of the Cairo Institute for Human Rights Studies, in the list. This error has been corrected. I confident that Egyptian women are perfectly in shape to deliver a beautiful left-hander if needed. Already there is problems with this council. With Safwat Higazy and some of the other FJP hardliners I can see women's rights being shoved into the background and equal rights for non-muslims being shoved under the carpet. This is not a good result. Carol, you seemed to be a pacimist and demanding. You Copts are less than 5% in population, and you think all the seats and presidency should be handed to you Copts. It is time that you spoiled Copts in the Mubarak era should realize the reality and live with it. Majority is authority, and will take care of you. ...to try to 'save' the Egyptian women. But rest assure that the ladies are perfectly capable of saving themselves from the 'terrible machos' They have have proven that multiple time and have no need for your 'concern.